very sick,” Eberly said. “With antiretroviral therapy you can take a pill a day and keep your virus at an undetectable viral load, so that’s much healthier for people to do.” Eberly said if someone tests positive for HIV that they can start antiretroviral therapy and keep the virus where it is undetectable in their system. property, states have the power and the constitutional authority to regulate those guns due to public safety, according to Tripodi. “The Bill of Rights is not granted by the government but rather the government recognizes that they existed before the formation of the government,” said Miller. “Your right to defend yourself from a tyrannical government, to have a gun, was taken from English common law and represented that not even the crown could touch this. These belong to you as an individual or to the states and therefore that is your right that the federal government will never go take and make no law that abridges them.” Miller said that he believes the Second Amendment gives you the freedom to practice our natural instinct, which is to fight or flee when you are in a certain predicament. The bill will allow those 21 and over to carry a gun, but the age requirement is lowered to 18 for active duty or reserve military and veterans. Oklahoma will join 15 other states that allow open carry without a permit or license on Nov. 1. Governor Kevin Stitt’s decision last month to approve Bill 2597, which will allow for anyone age 21 or over to carry a firearm without a permit, has generated controversy from both sides of the debate over open carry. University of Central Oklahoma political science professor Joe Tripodi, who is retired military and has grown up around guns his whole life, said he has some concerns for the new bill. “The impact on UCO is going to be transparent, you’re not gonna know the difference. However you got your gun, however you are now able to carry it, you still cannot carry it on any state school campuses,” Tripodi said. “But, you may see them on the other side of the street on University Drive or something.” According to Tripodi, the process included having to go through the Oklahoma State Bureau of Investigation to receive a conceal to carry license, which was very thorough. Tuesday, March 12, 2019 MLA Workshop: The Chambers Library is hosting a workshop on MLA formatting at 7 p.m. in Chambers Library Room 226. BSA Gospel Explosion: The Black Student Association is hosting a Gospel Explosion event as part of their Freshman Action Team Week from 6-8 p.m. in the Nigh University Center’s Constitution Hall. The event will feature a night of worship with testimonies from a variety of individuals. Life Skills Around Eating: This free and confidential group meets from 3:30-4:30 p.m. in Thatcher Hall Room 328. The group will discuss and focus on the affect regulation approach to eating disorders and will teach how to handle stress triggered by food. AAUW Study Hall: The American Association of University Women at Central will host a study hall for all students from 6-8 p.m. in Nigh University Center Room 320C. The event will feature fellowship and fun for students studying for midterms, and snacks will be provided. SAFE Interactive Arts Experience: The Student Alliance for Equality will host a hands-on art project from 7-8:30 p.m. in Room 119 of the Art and Design Building. The art lesson and activity will be led by Charleen Weidell, SAFE co-advisor and UCO faculty member. APA Workshop: The Chambers Library is hosting a workshop on APA formatting at 7 p.m. in Chambers Library Room 226. Anchor Weekly Meeting: Christian student organization Anchor will host their weekly meeting from 7:30-9:30 p.m. in the Nigh University Center’s Cherokee Room 213. The event will feature food and activities. Beta Upsilon Pie: The Beta Upsilon Chi fraternity will host a pie-throwing fundraiser for Bronchothon from 10 a.m. to 2 p.m. at the University of Central Oklahoma Clocktower by Broncho Lake. Non-Traditional Student Support Group: This group is designed to help non-traditional students find support at UCO with other students who can relate to your life experience and share resources to help meet personal needs and ensure success at UCO. The meeting is from 2-3 p.m. in Nigh University Center Room 322. Stress Paws: Come take a stress “paws” with therapy dogs from 3-5 p.m. on the Nigh University Center fourth floor. African Student Association General Meeting: The African Student Association will host a general meeting from 4-6 p.m. in Nigh University Center Room 314. Make Your Research STLR Workshop: The Chambers Library is hosting a workshop on how to improve research skills for class assignments at 7 p.m. in Chambers Library Room 226. The workshop is day two of the program and STLR Transformative credit is possible upon successful completion of all activities. Going Green: The Student Programming Board and the Students for Sustainability will be making t-shirt totes and flower pod castings from 11 a.m. to 1 p.m. at the University of Central Oklahoma Clocktower by Broncho Lake. T-shirt totes can be used to carry groceries and other items as an alternative to using plastic bags. Glamazon: The University of Central Oklahoma’s annual drag show, Glamazon, will be hosted 6-8 p.m. in the Nigh University Center Grand Ballrooms. The event highlights the art of drag and gives students the opportunity to learn more about the LGBT community. Chicago Style Workshop: The Chambers Library is hosting a workshop on Chicago Style formatting at 2 p.m. in Chambers Library Room 226. Muskogee VA Regional Office will be on campus to answer questions about education benefits and provide assistance in improving financial and occupational wellness 1-3 p.m. in Max Chambers Library Room 221. The event is a great opportunity for current or former military member, veteran, spouse, or dependent to learn more about your specific eligibility with the GI Bill® with a personal face to face meeting. Friday, March 15, 2019 Chill Skills: This group works to reduce conflict in your life; identify triggers, patterns and purpose of anger; gather more tools for enhancing communication, boundaries and healthy relationships. The group meets from 9:30-10:30 a.m. in Nigh University Center Room 322. LGBTQ Support: From 1-2 p.m. in Nigh University Center Room 322, the Center for Counseling and Well-Being will host a support group for those considering coming out as lesbian, gay, bisexual or transgender, and those who have recently come out. Anyone who identifies as LGBTQ, is questioning or unsure can meet and talk about various topics around sexuality, gender and other life issues. A Life Worth Living: This group works on skills for improving boundaries and strengthening healthy relationships, enhancing sense of self and ways to manage distress. The group meets from 2-3 p.m. in Thatcher Hall Room 328. The University of Central Oklahoma's Student Association passed legislation at their last meeting to create an election committee that would oversee the creation of an election test that UCOSA presidential candidates need to pass in order to run for office. CB19-203, passed unanimously, was presented by Sen. Emma Sawyer, was described as “an act regarding the codification of the special committee on elections and the appropriation of powers to it.” The bill creates an election committee to create a test that someone would need to get at least a 95 percent on if they wanted to run for UCOSA president. Originally, it was just the chair of Congress who would create the test each year. Sawyer’s idea is for multiple people to make the test so there would be less of a chance of favorability. In new business, Chair of Congress Tate Atkinson talked about CB19202, which proposed to change the requirements listed in the UCOSA bylaws to become UCOSA president. to receive funding for the next academic year. UCOSA’s next meeting is at 4:30 p.m. on March 25 in the Nigh University Center’s Will Rogers Room. and records do not list an attorney for him. “Regarding his son Eli, he had been struggling with schizophrenia since the age of 14 from what we’ve heard from family members,” Gorrell said. “It had clearly gotten progressively worse to the point of being paranoid schizophrenia.” The defendant told police his parents had not harmed him and that he shot them during an argument in his bedroom after he asked them a question about Satanism. “The real tragedy here is also about his daughter Ashten, younger son and of course Eli, who likely doesn’t even understand or fully comprehend what he’s done and will be facing a life of turmoil and pain,” Gorrell said. The Edmond Police Department obtained a search warrant last Friday to go back to the house with their bomb squad, with assistance from Oklahoma Patrol Highway bomb squad. They used bomb dogs and officers to walk the entire property outside and checked inside the house. “We are not at the point in our investigation where we want to say specifically what we were looking for,” said Jennifer Wagnon, EPD public information officer. “I have to start by saying, I have so many that it’s hard to pick one. I had a terrific childhood. If I had to pick the thing that rises to the top for me right now, it’s playing in the neighborhood with all my friends until dark. Back in the day I was allowed to run lose for hours on end because, everybody knew each other in the neighborhood. It was kind of like controlled independence.” Neuhold was born in Naperville, Illinois, a town right next to Lisle, Illinois, where she was raised. Neuhold’s father was an entrepreneur and had a desire to own his own business, so in the 5th grade she moved to Wichita, Kansas, for a year and then Tulsa, Oklahoma, where the family has been ever since. What led you to pursue these degrees? Going back to your college years, did you ever think you’d be where you are now? “That’s easy: my son. I have a 19-year-old son and he is such a sweet, fun, good person. He’s just my pride and joy.” Patti’s son has been playing hockey for 11 years and for eight of those years has been playing at a competitive travel level. For the past two years he has been playing hockey in Atlanta, Georgia, where he lives with a host family. “Anything I can sing along with. I love music and harmony of all kinds. I like anything from the lounge music of Frank Sinatra and Dean Martin to country music, show tunes, 80s music, all kinds. I love it all!” Neuhold also enjoys live music as well. She loves to attend performances put on by the University of Central Oklahoma at the Jazz Lab, Mitchell Hall and the Academy of Contemporary Music performance lab downtown. She even mentioned she will be attending the P!nk concert in Oklahoma City later this month. “That is a tough one… I have been to Paris, France, a couple times and I absolutely loved it. So, I have to say I would go back to Paris. There are other places I would go as well, but I think Paris is a number one spot for me. Sometimes you just feel a connection to a place, to a city, and Paris is just one of those.” According to Neuhold, if she could explore somewhere new it would probably be Ireland. But Paris has always been number one for her, she loves everything about it: the fashion, art work, history, the pace, architecture and the café experience. Neuhold even has a minor in French and said it helped her a lot with the language barrier when visiting. I love playing that; it’s like my connection to her. Boxes of photos, letters from friends and family, and sentimental jewelry.” She also said she would include her dogs in that list. Neuhold owns a miniature schnauzer named Idgie (named after Idgie Threadgoode in the book Fried Green Tomatoes) and a shih tzu named Poppi. Who has made the most impact on you and why? the piano instructors here on campus like, Sally Pollock, who are just so truly gifted. I’d love to have a tenth of their talent. I’d also like to improve my drawing skills; I enjoy drawing!” Neuhold said she comes from an artistic family. Her mother was an artist, her father and grandparents were talented musicians, and all of her family members sing as well. All throughout high school Neuhold was in show choir and at least five musicals. She carried on her artistic talents in college at Oklahoma Christian University, being a part of the freshman variety show and directing her club through Spring Sing her senior year. She even grew up singing at weddings and funerals of close family and friends. “I’d say brunch with my friends, walking my dogs and just relaxing. Actually, not having to do homework would be ideal! Now, when I say relax, it just means doing whatever I want to do when I want to do it. So that could be running errands, watching a movie at home or cooking.” Brunch is Neuhold’s favorite. When asked where she would go get brunch she said Hatched, Café Kacao or Neighborhood Jam. What goals would you like to accomplish during your presidency? sumer with a very efficient device.” Fitbit currently has three smartwatches: the Versa Light, Versa and Ionic. All other models have been discontinued but remain for sale until stock runs out. Group, which is in charge of reviewing campus free expression policies at other institutions and developing a proposal for an expanded and updated campus expression policy for UCO. Wood is a member of the group and he said it may be a way for UCO to deal with the executive order. 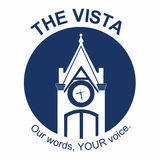 “[We will] ensure that UCO’s policy in this matter will be up-to-date, will address the wide range of issues associated with free expression on campus and will reflect best practices within higher education throughout the United States,” said David Macey, assistant vice president for Cultural and Global Competences, who serves as the group’s facilitator. Macey said during the 2018 fall semester, the group reviewed a range of essays, articles and policies from leading figures and institutions in higher education in order to identify best practices regarding free expression on college and university campuses. 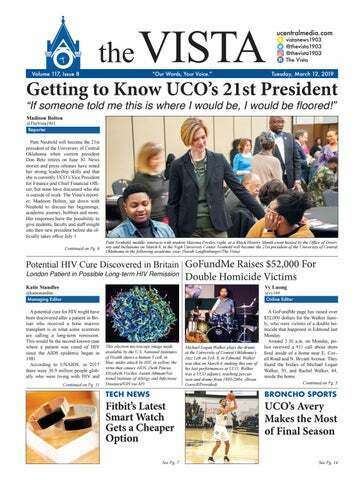 “[The] draft policy proposal and recommendations have been shared with UCOSA and with UCO’s Faculty Senate and Staff Senate for review and discussion,” Macey said. “We will meet on March 28 with members of the UCOSA, Faculty Senate and Staff Senate leadership teams in order to receive feedback for the further development and revision of the draft policy proposal.” Macey said the revised draft policy proposal will then be distributed to the UCO community to review and an open forum will take place at 2:00 p.m. on April 16 in Constitution Hall. Students, faculty and staff may ask questions, make suggestions and express concerns about the proposed policy. A final version of the policy will go forward to UCO leadership for consideration for adoption and implementation. in the first inning, the next run came from Missouri Western in the fourth. The Bronchos couldn’t answer in the fourth, but scored two runs in the fifth and three in the sixth to take the game. Gilbert hit the RBI single that scored Lexy Dobson to tie the game up at 2-2, and Puempel drew a twoout walk that scored Allie Eicher, which gave the Bronchos the lead. UCO scored three more runs in the sixth inning to win. Eicher led the Bronchos at the plate, going 3-for-4 with two RBI’s. She also scored two runs in the game. Bailey McKittrick earned the win for the Bronchos, throwing a complete game, strikings out two and allowing two hits, which moved her to 9-0 on the season. With the wins over Missouri Western, the Bronchos now lead the MIAA conference at 4-0. They travel to Lindenwood University Saturday for a double-header and to Lincoln University on Sunday for a double-header. seniors on this team that fought their tails off just to get here. They’ve done everything that was asked of them and they are a great group of kids. It always stinks to get to this point and have it end.” Seniors Blake Blessington, Madison Lee and Megan Hartness ended their collegiate basketball careers Thursday night. Blessington, who played 122 games for UCO, scored eight points. Micayla Haynes led the team in scoring with 13 points. Ireon Smith added 12 points and 11 rebounds. Both teams went back and forth to start the game. Central Missouri jumped out to a 10-4 lead before the Bronchos responded with an 11-0 run. left in the quarter with a score of 3022. UCO pushed a 6-2 run in the closing moments of the half, but a UCM 3-pointer extended the lead to 35-28 going into halftime. Central Missouri came out strong in the second half. The two teams traded buckets in their first possession before UCM went on a 12-0 run. UCM’s run lasted nearly six minutes before Hartness hit a pair of free throws with 3:45 remaining in the third quarter. UCO struggled as they shot 2-12 from the field and scored eight points in the quarter. Central Missouri outscored the Bronchos 27-8 headed into the final quarter with a 49-32 lead. Haynes kept going in the fourth quarter as she knocked down a 3-pointer followed by a pair of free throws. However, UCM stretched the lead, and pulled away for the win. Kaci Richardson added nine points and four rebounds for the Bronchos and Shatoya Bryson scored three. UCO shot 27.6 percent from the floor, making 16 of 58 shots, and made 4 of 24 from behind the arc. UCO’s 2018-19 season ended Thursday with an overall record of 19-12.
took the JUCO route.” Avery started his collegiate basketball career at Connor State University, after being recruited by now UCO Assistant Coach Cameron Henderson. After his freshman year averaging 10.7 points and 6.3 rebounds per game, Avery shot to stardom. During the 2016-17 season, Avery’s sophomore year, the 6-foot-6inch guard ranked second in the nation as he averaged 24.1 points per game, 10.9 rebounds and 3.8 assists. In all of his 34 games with the Cowboys, Avery scored in double figures as he recorded 40 points twice and 30 or more points in eight different games. His career high came against Eastern Oklahoma State College with 42 points. With those performances, Avery earned some attention and was finally offered a D-1 scholarship that he was willing to take. “I had interest my first year in a lot of schools, I thought about leaving my freshman year and going somewhere but my second year when I kind of blew up,” Avery said. “Loyola was probably the first or second school that showed interest. They told me a lot about what they could do for me in the future, as well as academically, and I believed in it, I went for it.” On April 26, 2017, Loyola University-Chicago men’s basketball head coach Porter Moser announced Avery’s signing. From JUCO to Division I basketball, Avery was where he wanted to be. “It was great. Teammates were cool, coaches were cool, Chicago is amazing,” Avery said. scored 45 or more points 3 times this season. SEC: LSU. The toughest pick so far, the SEC is loaded with a ton of quality teams, making this decision hard. I’m not quite sold on Kentucky or Tennessee yet, and the Tigers have shown the ability to be a really good basketball team. If they can get on a hot streak, they have enough talent to take down a loaded SEC. AAC: Houston. I’m all for being bold and taking the underdog, but this is just a little too lopsided for me. Houston is the top-rated team in the AAC, and is currently sitting at No. 8 in the country. The next closest is Cincy at No. 23. It’ll be a tough task for anyone to take down Houston. Mountain West: Nevada. Nevada should be the clear favorite to win the Mountain West. Nevada went all the way to the Sweet Sixteen in last year’s tournament, and has the potential to do so again. Winning the Mountain West should be Nevada’s first step before focusing on another tournament run. PAC-12: Oregon. The PAC-12 is easily one of the weakest conferences in basketball. That being said, I’m going with my sleeper pick, Oregon. Oregon has more than enough talent to win the PAC-12 with Payton Pritchard and Bol Bol, and has enough experience in the tournament to give me hope they can beat out Washington and UCLA for the PAC12 title. Big 12: Texas Tech. Definitely Texas Tech, they are doing the right things coming into the Tournament red hot and they’ve proven they can win big games as this season they have taken down Kansas and Kansas State. ACC: Duke. This one is easy and should be question, Duke. With RJ Barrett and a healthy Zion Williamson, the Blue Devils should be nearly unstoppable. Big East: Villanova. They always has a way of coming together as a team and making a run in the postseason. I like their chances. Pac-12: Washington. I think Washington’s conference just lacks talent this year. Arizona State is the only threatening team and I like Washington’s odds in that game. SEC: Kentucky. We all saw the embarrassing outing the Wildcats produced against Duke University in the season opener losing 118-84 but they have pulled back stronger as a team. Mountain West: Nevada. Just three losses on the season, all by unranked opponents, this team has proven they know how to win tough games and that will translate well in the post-season when nearly all games are a battle. West Coast: Gonzaga. This team is number 1 in the country for a reason and I’m sure they are ready to show their talent.